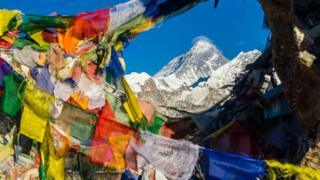 Image caption Mount Everest is the world's highest mountain, but is it the deadliest? As glaciers melt at a greater pace, there are concerns among expedition operators that bodies are becoming exposed on Mount Everest. The mountain is one of the crown jewels for climbers - but with the achievement of reaching the world's highest peak come risks. So how deadly is Everest and how does it compare with others in the region? Records suggest there have been just over 280 deaths on the mountain. While the number of deaths has been increasing, however, the death rate - the proportion of those who climb above base camp that die - has fallen to below 1%. Since 2010, there have been 72 deaths on Everest and 7,954 climbs above base camp. Most of these deaths are from avalanches or falls, which partially explains the difficulty in retrieving bodies from the mountain. Acute mountain sickness, with symptoms of dizziness, vomiting and headaches, has also caused deaths. While the risks are clear, Alan Arnette, a professional mountaineer who counts Everest and K2 among his climbs, points out that it is significantly safer climbing Everest than elsewhere in the Himalayas. On Everest, he says, "it's basically just following a well-used route". "There is a lot more infrastructure, more tea houses, more helicopter airlifts possible," he says. "In some of the mountains in Pakistan you have to rely on an army helicopter." The recent deaths of two climbers in Pakistan have highlighted that danger. The British climber Tom Ballard and his Italian climbing partner Daniele Nardi died attempting to scale the Himalayan peak Nanga Parbat, known colloquially as "Killer Mountain". Tom's mother, Alison Hargreaves, had previously died climbing K2, the world's second-highest peak, also in Pakistan. Both Nanga Parbat and K2 are considered two of the toughest of the "eight-thousanders" - the 14 mountains higher than 8,000m (26,000ft). Statistics on successful attempts and deaths are not as readily available in Pakistan. But calculations done by Mr Arnette and other climbers show Nanga Parbat has had 339 successful ascents to the summit and 69 deaths. Source: 8000ers, The Himalayan Database, data from some mountains based on estimates by experts. That works out at roughly one death for every five successful ascents to the summit. K2, which is part of the neighbouring Karakoram mountain range, is even more dangerous - there have been 355 successful ascents to the summit and 82 deaths. Most Himalayan ascents are not attempted from Pakistan but from mountains with their peaks in Nepal. And statistics are more detailed in this part of the Himalayas, thanks primarily to the work of journalist Elizabeth Hawley. Her Himalayan Database is seen as the most authoritative records of climbs, successful or unsuccessful, of more than 450 peaks in the region, including Everest. Unlike records from Pakistan, the Himalayan Database collects information not just on successful ascents to the summit but also on all those who venture beyond base camps, giving a more accurate view of the danger of the mountains. And for all climbs above base camp in the region, the death rate has dropped from 3% in the 1950s to 0.9% over the past decade. For Sherpas, the Nepalese professional climbers hired to support mountaineering teams, it has declined from 1.3% to 0.8%. Since 2010, there have been 183 recorded deaths above base camp in the region, according to the Himalayan Database, and over 21,000 climbs above base camp. The statistics also shine a light on which mountain peak poses the greatest threat to climbers. Source: The Himalayan Database, only includes Nepalese mountains. Since 2010, out of the four mountaineers to have climbed Yalung Kang, three have died. The overall number climbing these peaks is small, which does skew the figures, but ultimately reiterates the point that the mountains less well trod are potentially the most lethal.